...Mere alcohol doesn't thrill me at all. Frank Sinatra was obviously crazy! 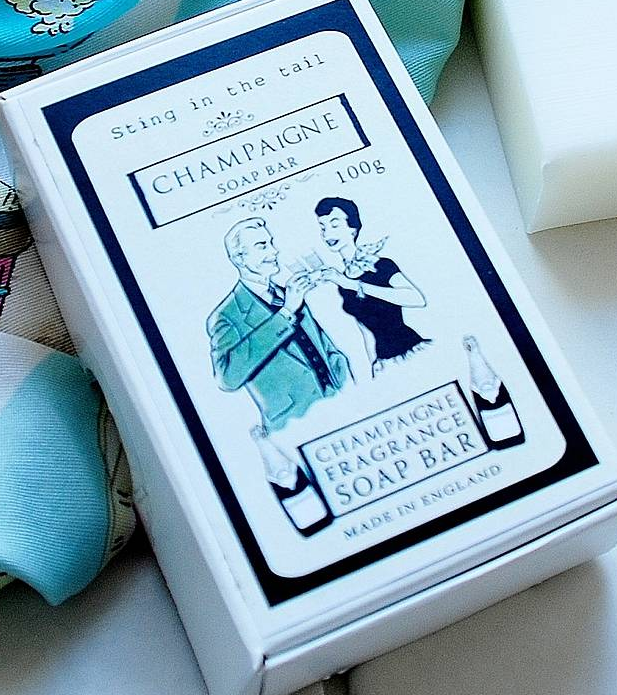 It's very nearly the festive season, and what better way to kick it off than with a bottle of bubbly, a glass of fizz or...a bar of retro Champagne soap?! For friends and family of fizz lovers we've gathered a handful of gift ideas where Champagne reigns supreme and there will be no doubt you know their guilty little sparkling secret. Whether it's because Champagne brings dedadence to any occasion with it's shiny gold foil or the mere giddyness it brings after just a few sips, Champagne is the classic, good time drink. Even when we're not with glass in hand, we're easily reminded of fizzing good times with little luxuries like this Retro Champagne Soap, just £6.50 from Monty's Vintage Shop at notonthehighstreet.com - a perfect stocking filler for girly friends who like a giggle. If you have a friend, like me, who is a sucker for both Champagne and chocolate (could one go without the other?! 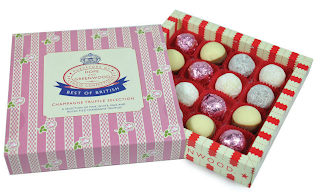 ), you simply cannot go wrong with this Best of British Box of Champagne Truffles, £9.95, from Hope and Greenwood, also at notonthehighstreet.com. A gorgeous little box of deliciousness with a selection of Champagne truffles, pink Champagne, dusted white Champagne, Buck's Fizz and milk Champagne it's a chocolate/Champagne lover' s dream. 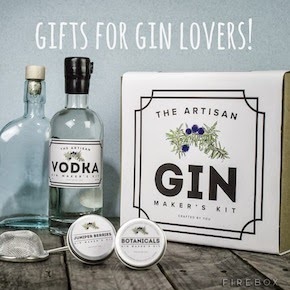 If this one is a tad obvious and perhaps you're buying for family (Aunt, Uncle, Grandad, Nan), this gorgeous 'Love tea, Worhsip Gin, Adore Champagne' might be more fitting. At £22.00 from Loveday Designs at notonthehighstreet.com, it can be personalised in size and layout, and you can add a message such as 'Happy Christmas Mum!'. 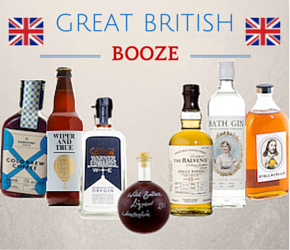 Sensible enough to remind us that as Brits we also love a cuppa (perhaps the morning after? 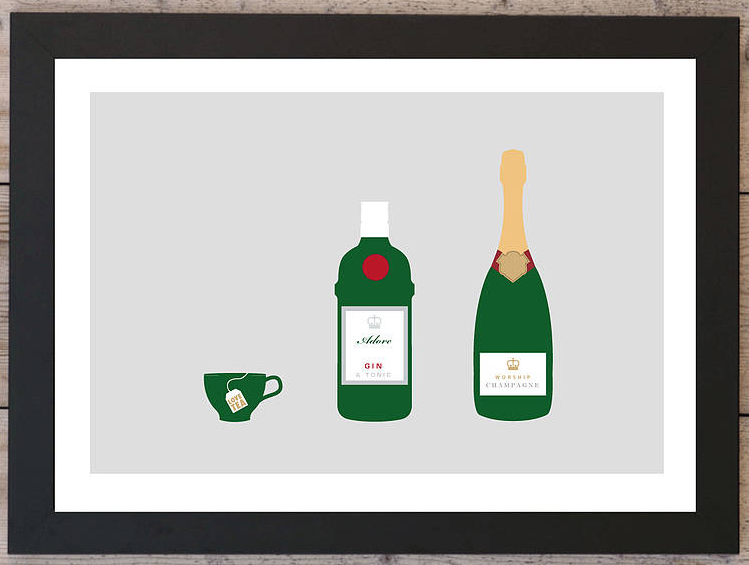 ), but it's really the Champagne and the gin who are the stars of this print. 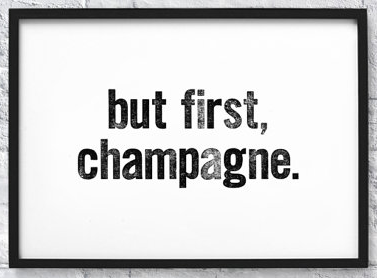 My ultimate words of wisdom gift for Champagne lovers comes from Leonora Hammona at notonthehighstreet, with her Champagne quote wall sticker (£35.00) with this glorious quote from Madame Bollinger - one of the 'grande dames' of French Champagne. 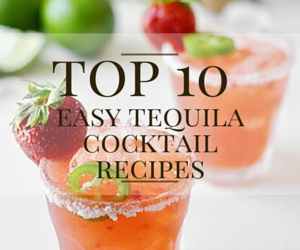 This is one for a girlfriend who wouldn't drink anything less than the real deal ('Cava? Never heard of it')! "I drink it when I'm happy and when I'm sad. Sometimes, I drink it when I'm alone. When I have company I consider it obligatory. 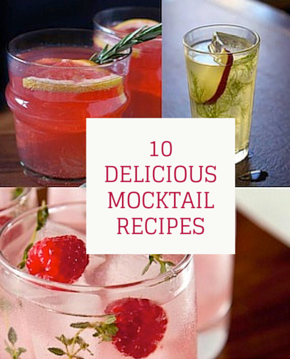 I trifle with it if I'm not hungry and drink it if I am; Otherwise I never touch it - unless I'm thirsty." As I am sure any Champagne lover will agree, it's impossible to to enjoy a drop of the sparkly stuff without the essential flute. If I ever, ever, see anyone drinking Champagne from a tumbler, let alone a plastic cup, they will be ignored! I'll settle for nothing less than a glass designed to keep my bubbles bubbly and the temperature well chilled. If I'm lucky, I'll be getting a set of these Silver Plated Champagne Flutes by The Orchard at notonthehighstreet.com (yes, this is a hint!). 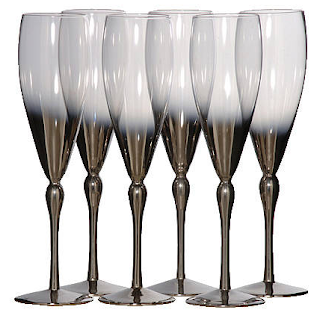 At £45 for a set of six, these elegant flutes are adorned with a silver plating on the base and running up the stem. Given that I've complied a 'Champagne gifts for friends and family' list, but I really had myself in mind, I'll also mention I love flamingoes....why? 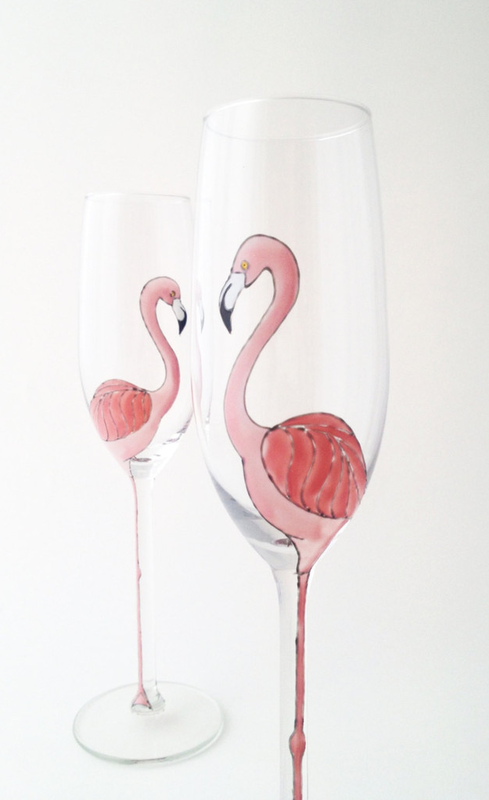 These super cute Falmingo Champagne Flutes are just £20 for a set of two from Toasted Glass - they're hand painted so definitely worth it. Also available in peacock and angel wing designs, they are just gorgeous. 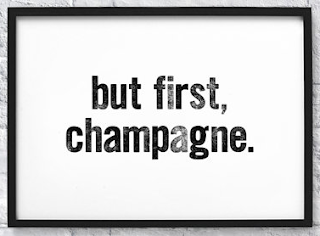 We have found many, many gifts for Champagne freaks like us, and whilst they go some way to filling the flute size hole in our day to day lives, there is simply no better gift for a Champagne lover, than Champagne. 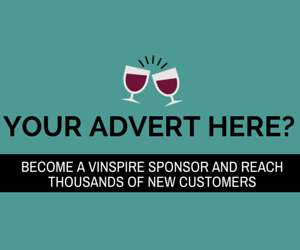 Yes, this time of year Veuve Clicout, Moet & Chandon and Bolly are everywhere, so why not treat your Champagne lover to something special and a producer synonymous with exceptional quality. It was only a couple of months ago Laura was sipping Champagne Billecart-Salmon's NV Rose in the midst of an extra bubbly bubble bath, and posted it as our Payday Treat. 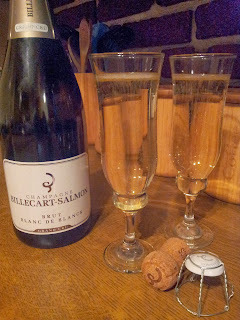 This time, I was lucky enough to be sent this Billecart-Salmon Tantalising Tasting Duo from Champagne Direct. Priced at £105 it contains a bottle of the Billecart-Salmon NV Brut Reserve and a bottle of the Billecart-Salmon NV Blanc de Blancs presented in an engraved black case. Save this one for someone special - these bubbles are devine and should be enjoyed only with the closest of friends - we don't want to give away this secret! The Billecart-Salmon Brut Reserve, NV is light and elegant in the glass with fine moussy bubbles, a white peach and pear aroma and a hint of white blossom flower. The delicate fizz on the tongue and the ever so slightly toasty meringue sweetness is to die for and lingers long after first sip. 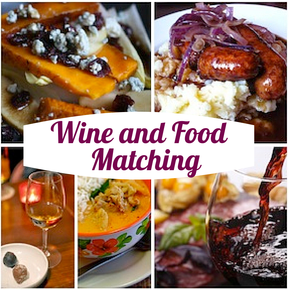 We enjoyed a glass on its own, then tucked into flaky cheese twists - a match made in heaven! 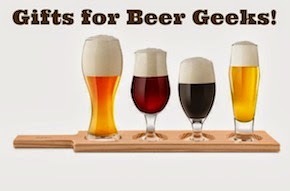 Be sure to serve well chill and in your prettiest glasses to give it the attention it deserves. 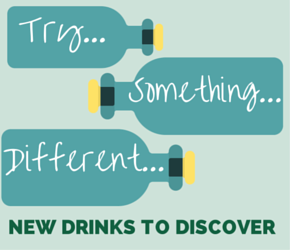 No, a plastic cup at your New Year's get together will not suffice...ever. The Billecart-Salmon Blanc de Blancs Grand Cru, NV offers a little more complexity - starting with its colour, which is more golden than the Brut Reserve. 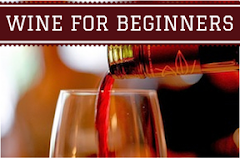 Even as you bring the glass up to take a sip you can smell dried fruits, nuts and buttery toast and you know something special is about to follow! The bubbles are delicate and a fleshy fruit flavour is accompanied by with one of buttery shortbread and a nutty almond and hazlenut finish. We enjoyed this on its own but next time it'll be with pan-fried scallops - rich and silky, just like this Blanc de Blancs. The folk at Champagne Direct suggest it also goes well with roasted langoustine, grilled seafood or the ultimate indulgence, caviar. Now, who is going to buy it for me for Christmas?? Here's hoping this gives you some fizz-piration for surprising your Champagne loving friends and family this Christmas. 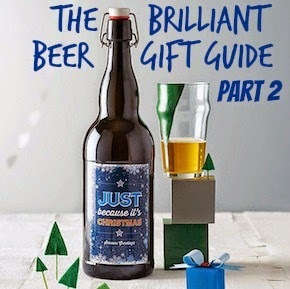 Either that, or you know what to put on your wish list for them to buy you!